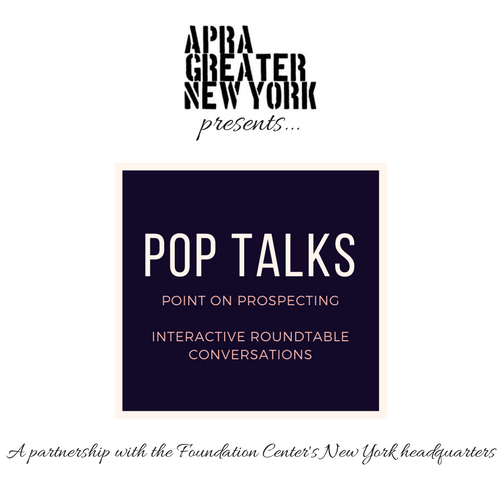 In partnership with Foundation Center's New York headquarters, Apra of Greater New York (Apra GNY) presents Point on Prospecting (PoP) Talks, interactive roundtable conversations that feature experts from within the nonprofit community collaborating on an array of subjects. On Tuesday, April 10, 2018, join us for a PoP Talk focused on advancing the fundraising goals of arts and affinity group-based nonprofits. Often arts and affinity group-based nonprofits lack the budget or manpower to operate a large development research department. With state and federal budgets only recently returning to pre-great-recession numbers, not-for-profits of all stripes (but especially arts and affinity organizations) have been forced to focus less on government grants and more on individual donations and solicitations. With the changing political climate, some organizations have been experiencing a boom in donations, while others, a bust. We will discuss how to handle this newfound decline, or spike, in individual donations. We will also cover strategies to best allocate your research tool budget and how to utilize free research platforms. We will discuss these tools and topics, along with tips for how to conduct research and prospecting for the non-research development professional.